Borussia Dortmund used a free kick routine straight from the training ground yesterday, the routine worked perfectly and Paco Alcacer was left free to score Dortmund’s opener. The routine worked wonders for Lucien Favre’s men, Marco Reus and Raphael Guerreiro duped the Werder Bremen defence when Reus sent the full-back on a fake run only for the Portuguese star to run back up and launch the free kick into Alcacer’s path. 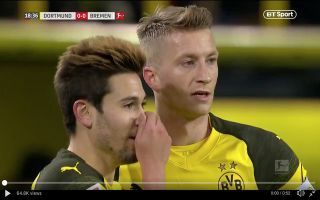 The Bremen defence were left bamboozled and Alcacer was left free to run towards goal and meet Guerreiro’s inch-perfect cross with a wonderful header. This is just brilliant ? You see Guerreiro and Reus discuss it, sell the fake so well, then deliver an inch-perfect cross for Paco Alcacer ? Lucien Favre’s endeavours with Dortmund this season could see BVB break Bayern Munich’s dominance in the Bundesliga. Dortmund are top of the league with a 9 point lead over title rivals Bayern.